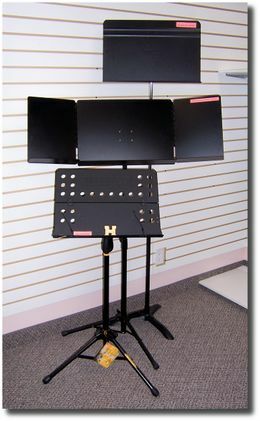 Music Stands Calgary | Accessories | V.A. Hill Fine Strings Ltd.
At V.A. 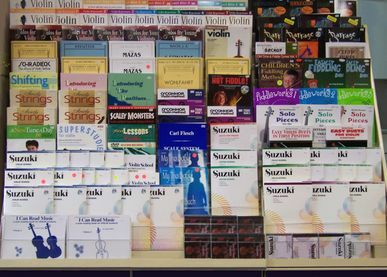 Hill Fine Strings Ltd., we carry an extensive line of violin accessories. 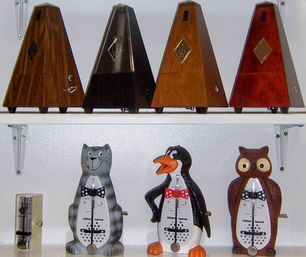 From tuners, metronomes, and mutes to rosin, music stands, and strings, we just about have it all. And what we might not have, we will search for and order in for you. Our music stands come in many shapes and sizes. Whether you are looking for a piece of furniture to match your living room or a sturdy but utilitarian stand to travel with you to your gigs, we will have one to suit. While some of our stands are one-of-a-kind, others are student-level basic types. Many of the stands fit into our custom-made stand carriers. For cello players, we have adjustable, collapsible chairs and stools. 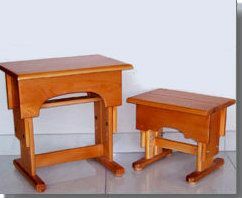 The items below are just a few of the stands and benches we have in stock at V.A. Hill Fine Strings Ltd. To see all of our inventory, we invite you to visit our Calgary shop. While the industry produces many light-weight, top-heavy music stands from which the music is bound to fall, we at Hill's refuse to stock these flimsy models. All of our fold-down portables are well-balanced with sufficient weight to be stable when supporting your music books. We have come to rely on the industry standards by Manhasset, K&M, and RATstands. We feel that your music stand should not be the most frustrating part of your music lesson, so we choose our stand models based on their functionality. Our wooden stands have been designed not only for their functionality but also their great looks. They actually are pieces of fine furniture! Whether you are trying to match the oak in your living room or the glossy black of your baby grand, we will likely have a stand that will suit your needs. If we don't have one in stock, we will gladly locate and bring one in for you. For a studio stand not requiring portability, we offer well-built, heavy-duty stands in various styles. Whether you need something extra tall, or just something extra strong, you will find it at V.A. Hill Fine Strings Ltd. These sturdy musicians’ chairs are made by Vivo USA (Adjustrite). They are adjustable for both height and bench angle, collapsible for ease of transport, and come in regular and tall models. The adjustable child’s stool is designed for the younger child unable to use the regular height of a standard chair. Our cello stands are a practical and stylish solution for safely storing a cello when not returning it immediately to its case. Whether you play violin, viola, cello, or double bass, our cases and carrier bags are designed with portability and protection in mind. At Hill's we have an extensive selection from which to choose. The items below are just a few of the cases and carriers we have in stock at V.A. Hill Fine Strings Ltd. To see all of our inventory, we invite you to visit our shop. 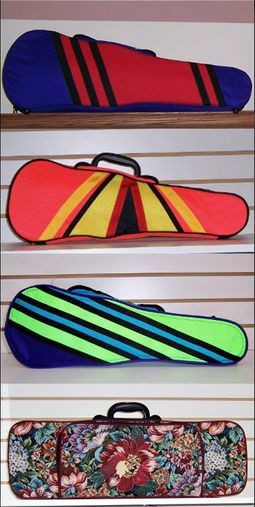 In addition to our music bags, we have designed a number of specialty bags to help you with your other music necessities. 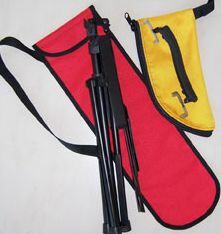 Our stand bags are great for preventing the inevitable loss of screws, knobs, or edges catching onto clothing. The age-old problem of what to do with the shoulder rest that does not fit into the case is solved with our shoulder rest bag. 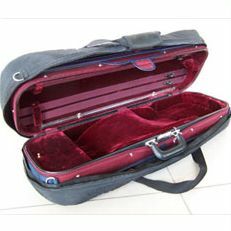 Our insulated case covers for violin, viola, and cello are invaluable year-round, protecting your instrument from extreme temperature and humidity fluctuations, as well as protecting your case from the scuffs and scrapes of normal everyday wear. The new cases carried by Hill's are all chosen not only for their good looks but also for their reliability. While it may be possible to find a less expensive case in a lighter-duty product, we feel that it is false economy to put a good instrument into something less than protective. 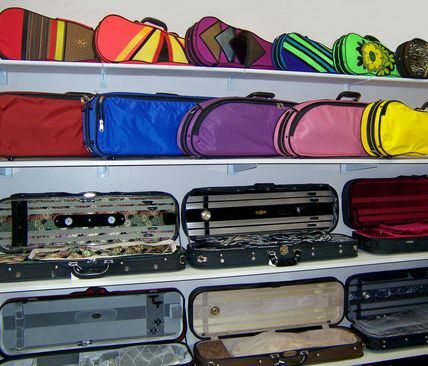 Whether the case you are looking for is for a violin, viola, cello, or double bass, we have good quality cases designed to protect your investment. We also carry second-hand cases, especially in the smaller sizes. V.A. Hill Fine Strings Ltd. has partnered with a very talented seamstress to produce an array of one-of-a-kind case covers and music bags. As they sell, the selection will be ever-changing. What can we say about these unique works of art, other than “a picture is worth at least a thousand words”! This double bass cart is designed to assist in reducing the effort required to transport a double bass. The wheels are large enough to be used out-of-doors. When the cart is converted to a stand, the double bass can be left on the supports while being played. This is a well-made, heavy duty unit. V.A. Hill Fine Strings Ltd. stocks an extensive array of accessories to assist you in your musical endeavours, and we bring new items in on a regular basis. 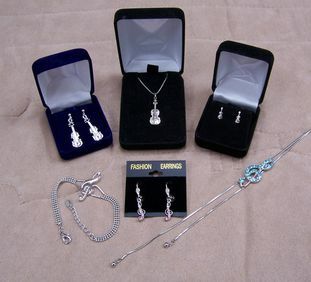 If we do not carry a specific item you are looking for, we will bring it in for you. If we feel it is a useful item, we will keep it in stock. 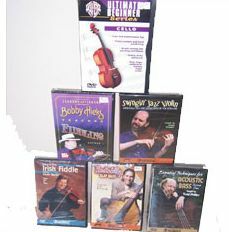 We carry a large selection of instructional DVDs for the beginner to the more advanced player, as well as educational (and entertaining!) DVDs for children. 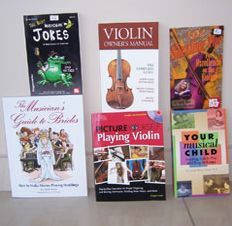 We stock a wide variety of lesson books, including Suzuki, Royal Conservatory, Mark O'Connor Fiddle Method, and Fiddle Club. We also carry books in every genre, including Celtic fiddle, country/ swing, gospel, jazz, wedding, seasonal, classical, and popular movie/ TV themes. The topics of our musically-related books range from instrument care and maintenance, to encouraging your child's musical potential, to playing without injury. We even stock the ever-popular Musicians' Joke Book! Is jewellery with a music theme your thing? Perhaps you can find that "something different" for yourself or satisfy that special someone's wish list. Keep time with ease, with one of our many metronomes. Whether you're looking for an electronic or a traditional metronome, or one with just a little more attitude, we have it here! Is there a specific item you are looking for? Give us a call to see if we have it in stock.